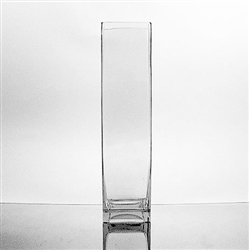 Glass Rectangular Vase, 16" x 4"
BLOWOUT SALE! Glass rectangular block vase, 16" tall, 4" x 4" top opening. These are nice quality glass, perfect for Manzanita Branches centerpieces. Glass vases may require additional shipping. Shipping discount promotions do not apply to glass vases. Glass Cylinder Vase, 8" x 5" Glass Cylinder Vase, 6" x 4" Geometric Glass Terrarium, Diamond-Faceted Glass Rectangular Vase, 8" x 3"
Heavy weight - well made - super buy for the money. I have to say customer service is amazing - while my initial order I received the wrong vase - I got the 16" round - after contacting customer service they immediately responded to my request and shipped the correct vase - very efficient and GREAT service! I will recommend this company!